Stephen Alomes, Why Hawthorn supporters boo Adam Goodes: a story of class and prejudice, ABC The Drum., 29 May 2015. 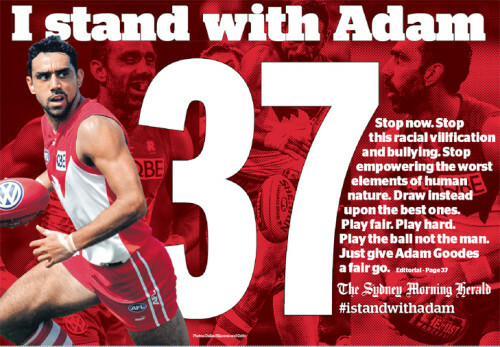 Matthew Klugman & Gary Osmond, The AFL has failed Adam Goodes with its reluctance to condemn booing as racist, The Age, 29 July 2015. Braham Dabscheck, Adam Goodes: His Legacy, The Footy Almanac, 30 July 2015. Daryl Adair, Man up? I see a man down: booing and being Adam Goodes, The Conversation, 31 July 2015. Sean Gormal, Interview on Newstalk, 27 July 2015. Matthew Klugman, Interview on Sky News, 29 July 2015. Matthew Klugman, Interview on Late Night Live, ABC Radio National, 29 July 2015. Matthew Klugman, Interview with Linda Mottram, ABC Sydney, 30 July 2015. Sean Gorman, Interview on Mornings with Nicole Dyer, ABC Brisbane, 30 July 2015. Sean Gorman, Interview on Central Australian Aboriginal Media Association Radio, 30 July 2015. Matthew Klugman, Interview on Mornings with Fiona Parker, ABC Melbourne, 31 July 2015. Gary Osmond, The uncomfortable truth we have to face as a result of the Adam Goodes booing saga, The Advertiser (Adelaide), 29 July 2015. Colin Tatz, quoted in Keith Parry, Booing Adam Goodes – racism is in the stitching of the AFL, The Conversation, 29 July 2015. Colin Tatz, quoted in David Sygall, Why booing Sydney Swans star Adam Goodes is racist, The Age, 30 July 2015. If there are other interviews/articles that are not listed here, please send them to Tara for inclusion.